These are my favorite beaches on the Kona side of the big island of Hawaii! I've linked the Trip Advisor pages of the beaches through the photos for more information. To gauge my recommendations, know that our preferred activities are snorkeling, swimming, and staring at the ocean from the shade. All of these were amazing for that, but what I mention in their captions is the primary reminder you should keep in mind if you visit them. For example, the first beach, Beach 49, is accessed from the grounds of a gated community and there are a limited amount of parking spaces/ passes, so going early in the day (before 10) is key to getting in. Happy beaching! Get here early for parking and bring an umbrella if you plan on spending the day! 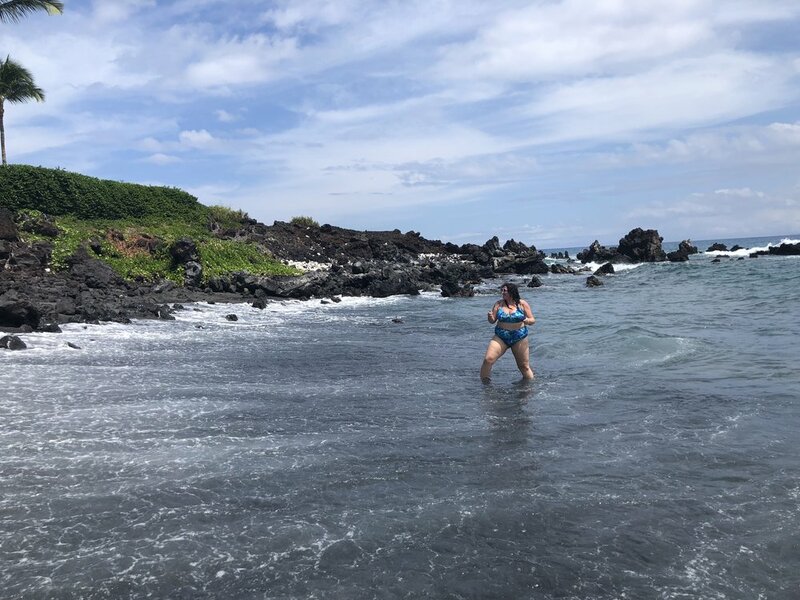 The black sand gets hot but it's a small, quiet beach, unique and peaceful. The water here was so clear! Parking wasn’t bad but this is a popular beach if you’re looking for quiet. This is such a great beach! A narrow strip of rocky shore, but lots of secret pockets of great snorkeling, and a nearby cove you can only reach by swimming around the rock. Parking isn’t bad but this is also a popular beach, come early for a good spot as the shore is narrow. The volcanic rock we’re standing on gives way to the most beautiful wall of reef I’ve ever seen! Tons to see when snorkeling here, a truly unique beach. While this isn’t technically a public beach, all beaches in Hawaii are public beaches! This is actually the shore along a great restaurant and beach club called Lava Lava. It’s a Kona favorite, and is almost always packed. When it comes time for sunset, you’ll see why. While there are endless beaches to explore here, these are the ones I’ve really loved on our visits. Their images all link to their information on TripAdvisor, and will also suggest nearby beaches for you. Let me know if you have favorites of your own!